Emerging-market currencies, bonds and stocks fell sharply Friday, as rising bond yields in developed markets and an improving U.S. economic outlook dimmed the allure of assets in countries from Thailand to Chile. Investors have sold emerging-market assets for most of May amid speculation that the U.S. Federal Reserve is preparing to wind down its bond purchases as economic growth picks up. Fed stimulus has kept Treasury yields and borrowing costs near record lows, pushing money into economies as diverse as Thailand, Mexico and South Africa, where returns are higher. I wonder where an “improving U.S. economic outlook” can be discerned. Not so far in the employment numbers and certainly not in the inflation numbers, which have been moving in the opposite direction of the ‘threshold’ level! Whenever the previous doses of QE were removed, long term interest rates, which had been rising, fell. In September the FOMC began QE3. Long term interest rates stayed ‘put’. But when ‘threshold’ levels for unemployment and inflation were added they shot up! 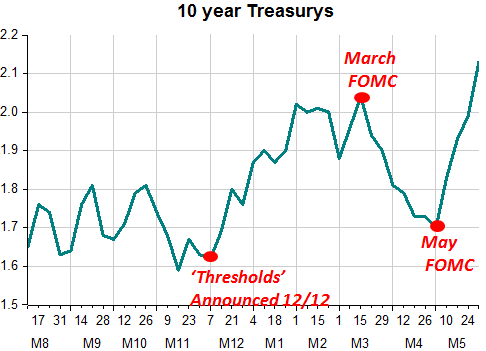 After the March FOMC meeting they ‘tanked’, only to ‘shoot-up’ again after the May 1st meeting. Why these rate gyrations? Maybe due to nuances in the post meetings statements. It is likely that rates fell after the March meeting because market participants ‘felt’ that ‘policy accommodation’ could end sooner than previously expected and rose after the May meeting because that ‘feeling’ was dispelled. Why didn´t emerging markets tank in December 12-March13 when rates were going up, but did so now? And that´s the opposite of the ‘popular’ interpretation. In other words, long rates rose because the market puts greater weight in a more ‘solid’ recovery exactly because the Fed won´t ‘taper’ bond purchases soon! And since higher US growth is a positive for the world economy, recent outcomes in emerging markets could reverse. I would go even further and say it is confusing and adding volatility to markets.